Good dog hygiene is just one of the many responsibilities you must uphold a responsible dog owner. Along with: keeping your furry friend fed, making sure they have access to clean water, taking them for walks, and making sure that they lead a happy and relatively stress-free life. Keeping your dog’s ears clean is an important part of dog hygiene, and one that novice owners may not know as much about. It’s important to know the basics when it comes to how to clean your dog’s ears, so you don’t accidentally cause your pupster unnecessary pain or discomfort while doing so. Regular cleaning will help prevent things like ear mites and infections, but it’s still possible that you may notice built-up wax, dirt or discharge in your dog’s ears over time. For chronic ear infections like chronic otitis check this easy at home to use treatment with hydrocortisone. When you notice that your dog’s ears need to be cleaned, it’s important to know what to do about it. Having a clear idea of what you can use to clean your dog’s ears safely, knowing signs of different ear issues, and knowing when it’s time to see a vet are all key to proper care of your dog’s ears. Once you know the basics, you can buy a cleaner or even make one to maintain your dog’s ear health at home. Black Stuff in a Dog’s Ear – What is It? It’s important to pay attention to your dog’s ears. Checking regularly for different-colored build up and symptoms like head shaking can help you spot a problem and fix it early on. If you notice a deep brown discharge with an unpleasant smell, for example, you know that chances are your dog has an ear infection. Taking care of infections like this early on can save your dog from a lot of discomfort. According to What’s Wrong With My Dog? guide if you notice that your dog has black granular discharge (like coffee grounds), your dog probably has ear mites. Ear mites are parasites that feed on dogs’ ear wax. They are very small and hard to spot, which can be a problem. If left untreated, ear mites will cause irritation and can eventually lead to your dog’s ears becoming infected. If you notice that your dog’s ears are dirty, check to make sure they don’t smell before you clean them. One of the signs that your dog might have an ear infection is if there is a very bad smell. If you notice that there is a bad odor, it’s best to take your dog to the vet to get a proper diagnosis and make sure you use the right treatment to clear it up. 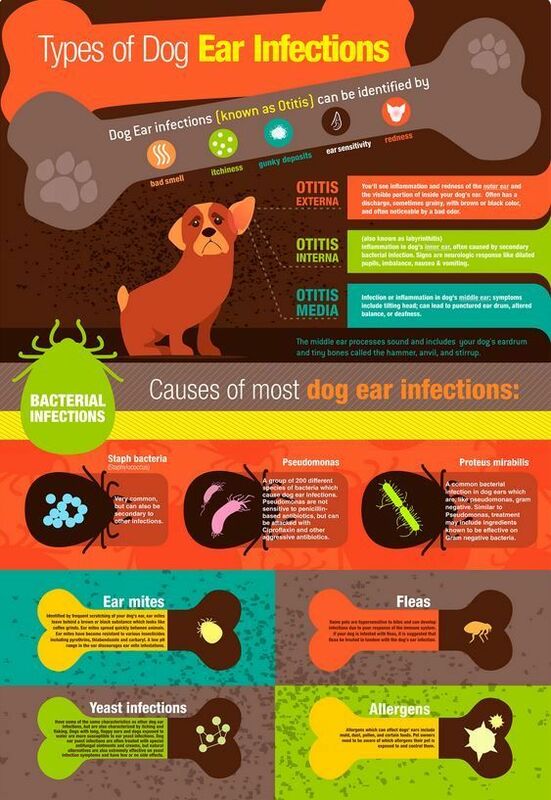 Other symptoms to watch out for when it comes to dog ear infections are rubbing, shaking, and scratching the ears. When your dog’s ears are infected they can also become red or swollen. Things like scratching and allergies may also lead to hair loss or scabs on the outside of your dog’s ears - known as Ear (Aural) Hematoma. If you suspect that your dog has an ear infection, it’s important to go see your vet to have it verified. A vet will likely give you a medicated ointment or drops to put in your dog’s ear, which you can’t make or buy over the counter. Before administering this treatment, it’s important to clean your dog’s ears with a gentle cleaner to get rid of some of the built-up discharge. You can store this solution in a small plastic spray bottle or cosmetics container and use it until the infection and build-up have cleared. Regular ear cleaning and grooming around the ears can help prevent future problems, so keep some of this ear cleaner handy! If you’re wondering how often to clean your dog’s ears, at least once a month is a good standard to follow. What is the Best Way to Clean a Dog’s Ears? Floppy-eared dogs can have chronic ear infections. Dogs such as Cocker Spaniels, Irish and English Setters, and Basset Hounds and Bloodhounds are prone to have ear infections and other ear problems. Dogs with erect ears rarely have such issues, except for German Shepherds, who despite their short, tall ears tend to have similar problems. Infections with both yeast and bacteria are not uncommon for dogs who are affected, and they can also have mites. The Dog Bible goes on to explain that the best way to clean a dog’s ears is using a cotton ball or possibly a folded over tissue. You want to avoid using a Q-tip because it can encourage you to go deeper into the dog’s ear. This is something you don’t want to do. Using a Q-tip can cause damage to your dog’s ear canal or push discharge and other material deeper into the ear. There are many products out there that can help you clear up any dirt, ear mites, or infection in your dog’s ears quickly and easily. A couple of these are Petpost Pet Ear Cleaner Wipes (with coconut and aloe) and VetWELL Cat and Dog Ear Cleaner. These products make it easy to treat your dog’s ear conditions at home effectively. What Can I Use to Clean my Dog’s Ears at Home? It should be easy to find pet ear cleaners for dogs in-store or online, but there are some homemade alternatives out there if you want to go with something more natural or if money is an issue. These solutions are simple and use things you might already have around the house. Here are a few common household products that you can use to make simple solutions for cleaning your dog’s ears at home. Holistic veterinarian, Doctor Karen Becker, recommends using a solution of ½ apple cider vinegar and ½ purified water to clean out dogs’ ears. Using this solution regularly with a cotton ball to keep your dog’s ears clean is supposed to help prevent ear infection and itchy ears. Witch Hazel is another at-home remedy that can be used to clean your dog’s ears, but it should be used with caution. This herbal remedy can be used on topically to sooth your dog’s ears and reduce inflammation because it shrinks skin tissue. Holistic veterinarian Dr. Judy Morgan says that applying a few drops to your dog’s ears can be an effective way to dry discharge and help with inflammation. When using Witch Hazel, it’s important to remember that it can make issues with dry skin worse and that it has the potential to cause kidney and liver damage if your dog ingests it. Most of us have hydrogen peroxide at home. This antiseptic can be used for many purposes, including cleaning, bleaching, and whitening teeth. But did you know that it can also be used in a solution to clean your dog’s ears? It’s as simple as using half a cup of water and half a cup of hydrogen peroxide, storing it in a container, and wiping your dog’s ears gently with a cotton ball. In this quick video Dr Jones briefly mentions the benefit of using Epi Otic for removing all the debris and wax from your pet's ear as well other OTC products like Apple Cider Vinegar, Olive Oil and Aloe Vera Gel. Keeping your dog’s ears clean is very important. If left to get dirty, the ears can quickly become infected and/or infested with ear mites. This is unpleasant and uncomfortable for your dog, not to mention the behaviors that follow (scratching, shaking, etc.) can cause even more damage to the ear. That’s why basic dog ear care is an essential thing for every owner to know about. Some things you should know are what ear mites or an infection looks like. You should also know basic ear cleaning techniques like what to do and what not to do. Having an idea of when to get your dog to the vet for treatment is important too. If you clean your dog’s ears, you should know which products are best to use and won’t be irritating. This might include homemade remedies if those are more your style. If you’re not sure what’s wrong with your dog’s ears or feel like you can’t clean them out yourself, you can always go to the vet. A vet will be able to properly diagnose your dog’s ear issues and can help get your dog’s ears back to normal. This can be especially helpful if your dog needs a deep ear cleaning, other solutions you have tried aren’t working, or your dog needs medication to clear up an infection. DISCLAIMER: ALL THE INFORMATION PROVIDED IS FOR INFORMATIONAL PURPOSES ONLY, AND IS NOT A SUBSTITUTE FOR PROFESSIONAL VETERINARY ADVICE, CARE, DIAGNOSIS OR TREATMENT. FOR MORE INFORMATION PLEASE READ OUR DISCLAIMER. Morgan, Diane. Siberian Huskies For Dummies. NY: John Wiley & Sons. 2011. Tedaldi, Jake. and Parker, Robert B. What's wrong with my dog? New York: Crestline. 2011. Hotchner, Tracie. The Dog Bible. New York: Gotham Books. 2014.